And, so, yes, there is wilderness (or, at least a “wilderness area”) in Indiana, and what’s more remarkable is how close the Hoosier National Forest and “the Deam” are to the city of Bloomington, which is home to a bustling Big Ten university and is a thriving town in its own right. Being an inquisitive person, my dad had plenty of questions for me about the Hoosier National Forest and the Deam, particularly in regards to their history. How did the Hoosier National Forest and the Deam Wilderness–as federally controlled areas–come to be? The answers provide an interesting window into Depression-era history and, specifically, the Civilian Conservation Corps work in Indiana, which you can read more about here. 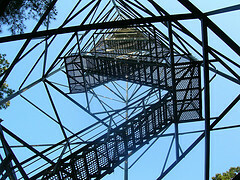 In fact, the Hickory Ridge fire tower is, like the forest it overlooks, a testament to that past. Recently, Indiana University’s Lilly Library acquired a collection of archival material about the Deam Wilderness, which I suspect would provide some answers to my dad’s questions, as well. The materials were collected by Claude Ferguson and donated to the Lilly by the Indiana Forest Alliance, and in April, a special event was held at the library to mark the official public unveiling of the Deam Wilderness papers. I didn’t attend the celebration, but perhaps, soon, I’ll get a chance to comb through the files myself and post some of what I’ve gleaned. In the meantime, if you’re on Indiana University’s campus and are interested in looking at this collection, go right ahead: the Lilly library and its reading room are open to the public.